I’ll be in Ottawa on April 28, reading at the Ottawa Writers Festival with Jonathan Bennett (a fellow ECW author) and the great Miriam Toews. The artistic director of the festival seems to love the book (first in radio and now in print) – though when I meet him I’m going to have to tell him I don’t have one million followers on Twitter. Though Ottawa’s a government town and I think they count differently. PS: That Google search photo is authentic. 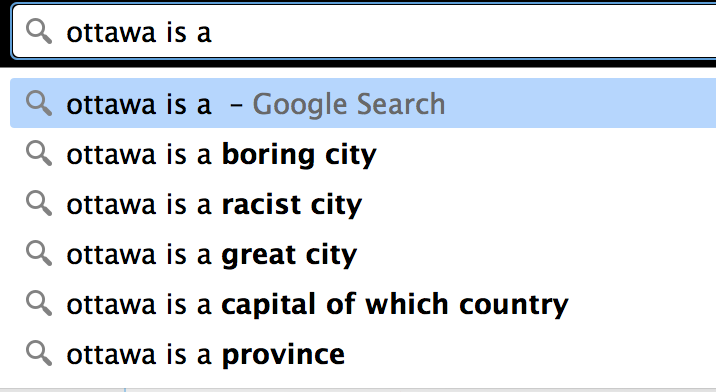 That’s what comes up when you type “Ottawa is a…” Don’t blame me. This entry was posted in News & Reviews and tagged government, Jonathan Bennett, Miriam Toews, Ottawa, Ottawa Writers Festival. Bookmark the permalink. Post a comment or leave a trackback: Trackback URL.